Bhitarkanika National Park is a national park located in the Kendrapara District of Orissa in Eastern India. The park encompasses an area of 672 km² of the Bhitarkanika Mangroves, a mangrove swamp which lies in the river delta of the Brahmani, Baitarani, and Dhamra rivers. The national park is surrounded by the Bhitarkanika Wildlife Sanctuary. Gahirmatha Beach lies to the east, and separates the mangroves from the Bay of Bengal. The park is home to the endangered Saltwater Crocodile (Crocodylus porosus), White Crocodile, Indian python,King Cobra, black ibis, darters and many other species of flora and fuana. The national park was created in September 1998 from the core area of the Bhitarkanika Wildlife Sanctuary, which was created in 1975.The sanctuary is the second largest mangrove ecosystem in India. Mangroves, trees like sundari, thespia, casuarinas, and grasses like the indigo bush, and more. 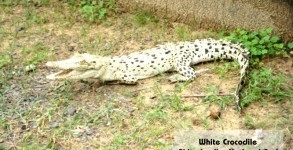 The park is home to the saltwater crocodile, white crocodile, Indian python, black ibis, wild pigs, rhesus monkeys, chitals, darters, cobra, water monitor lizard . Olive ridley sea-turtles nest on Gahirmatha and other nearby beaches.Bhitarkanika has one of the largest populations of endangered saltwater crocodile in India and is globally unique in that 10 percent of the adults exceed 6 m length. Nearly 700 saltwater crocodiles inhabit the rivers and creeks. 215 species of avifauna including eight varieties of Kingfishers. Birds such as Asian Open Bill, Cormorants, Darters, Black Ibis, Egrets, are frequently seen in the park. Mangroves are salt tolerant, complex and dynamic eco-system that occur in tropical and subtropical inter-tidal regions. Bhitarkanika is one such location of rich, lush green vibrant eco-system lying in the estuarine region of Brahmani- Baitarani in the North-Eastern corner of Kendrapara district of Orissa. The area is intersected by a network of creeks with Bay of Bengal on the East. The alley between the meandering creeks and rivers, houses the second largest viable mangrove eco-system of India. Its 672 km². of mangrove forest & wetland, provides home to well over 215 species of birds including winter migrants from central-Asia and Europe. Giant salt water crocodiles and variety of other Wildlife inhabitate in this eco-system which form Asia's one of the most spectacular Wildlife area. An area of 145 km². have been notified as Bhitarkanika National Park vide Notification No.19686/F & E dated 16.9.1998 of Forests & Environment Department, Govt. of Orissa. It has much significance with regard to ecological, geomorphological and biological background which includes mangrove forests, rivers, creeks, estuaries, back water, accreted land and mud flats. 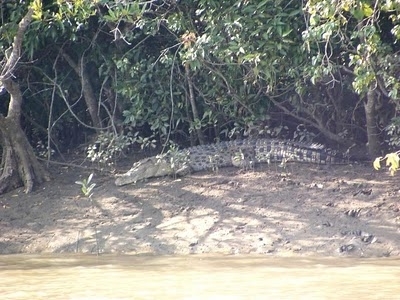 Bhitarkanika National Park is the core area of Bhitarkanika Sanctuary. It is a very good place to sight the giant Salt Water Crocodile, some growing to 23 feet in length, along with other reptiles like the Water Monitor Lizard and the King Cobra. Spotted deers and Wild Boars are abundant in the park and can be spotted at all the major locations. Eight varieties of Kingfishers are found here and can be spotted along the many creeks and riverines within the park. Bhitarkanika has a very rich historical and cultural past. It used to be the hunting grounds of the esrtwhile King of Kanika . The hunting towers and artificial watering holes can be seen at many places including Bhitarkanika trail and at Dangmal. It is also the home of medieval Hindu temples which can be found dotted throughout the sanctuary. But the major attraction remains the wildlife wealth. Here's the our members favorite photos of "National Parks in Orissa". Upload your photo of Bhitarkanika National Park!